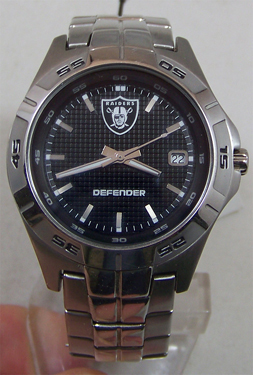 Click the button below to add the Oakland Raiders Fossil Watch Mens Three Hand Date Wristwatch NFL1049 to your wish list. NFL Football sports fans team logo wristwatches watches. New, unworn working watch in Fossil collectible tin. 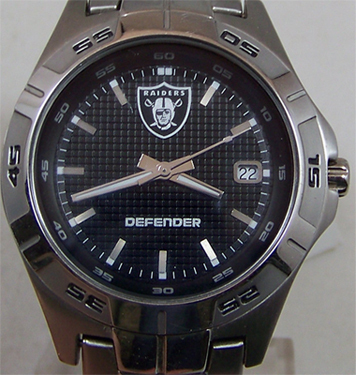 This new mens Oakland Raiders Fossil watch features an applied team logo at 12 O'clock against a textured black dial. Includes a date display window at 3 O'clock. Three hand quartz movement. Stainless steel Case and comfortable contoured stainless steel band. Mens case diameter 39 mm. 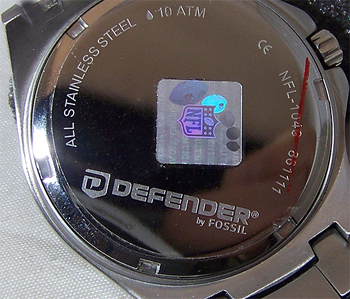 Water resistant up to 10 ATM (100 meters,335 feet). Rare Fossil Defender collectors logo. This timepiece makes a great gift. IN HAND so SHIPS NOW!! in a Fossil Collectible Tin.